What Do Geologic Maps Tell Us About the Locations of Natural Hazards? 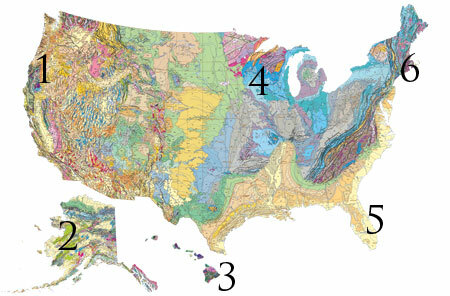 Geologic mapping is vitally important to education, science, business and a wide variety of public policy concerns. For example, geologic maps help us assess the likelihood, prepare for, and minimize damage from natural hazards. Learn more about geologic maps and their relation to natural hazards here by clicking on the numbers on the map. 1. 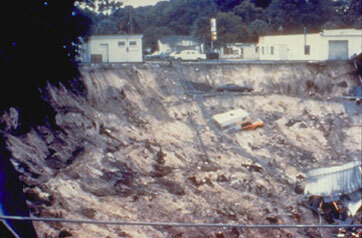 Landslides occur along slopes where masses of soil and rock material are susceptible to being pulled down by gravity. 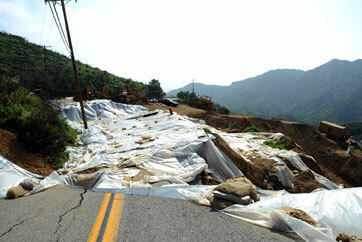 Heavy rains and earthquakes are two ways that landslides may be triggered. Geologic maps can pinpoint areas at risk of rockfalls and debris flows, because such landslides pose serious risks to people and property. 2. 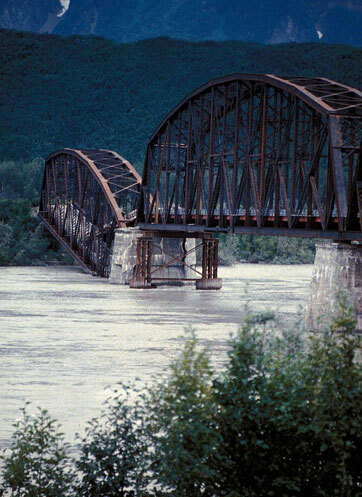 Earthquakes are sudden movements or tremors in earth that result from the abrupt release of strain that has accumulated over time beneath the surface. Geologic maps identify fault zones, some of which are still active and cause earthquakes. 3. 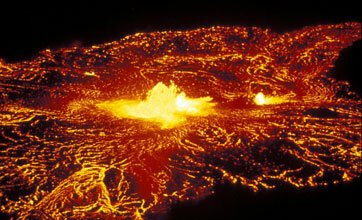 Volcanoes erupt when hot magma, gas and ash emerge at the earth's surface. Though volcanic vents can remain dormant for long periods, geologists carefully monitor and map them, watchful for signs of impending activity. 4. 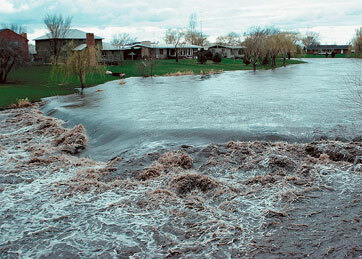 Flooding --the covering by water of land not usually under water-- typically happens when a stream overflows its banks, or when storms and high tides force ocean waters onto land. People rely on geologic maps to show the locations of flood basins, which ofter are swampy, and flood plains, often rich with sediment deposists. 5. Sinkholes are circular, often funnel-shaped depressions found in areas underlain by karst, where rock types such as limestone, dolomite and gypsum are easily dissolved and form underground drainage and caves. Geologic maps can help people avoid building in areas susceptible to sinkholes, such as the one that swalloed a Florida home in 2013. 6. 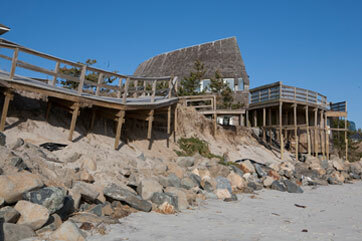 Coastal Erosion is the wearing away of land features aong the seashore, often by extreme weather events such as sever storms, hurricanes, and tsunamis. Superstorm Sandy, for example, drastically altered maps as it permanently changed the shape of shorelines in parts of New Jersey and New York in 2012.